Our cottage loaf is a great starter recipe for beginners who want a simple fresh-from-the-oven bake. 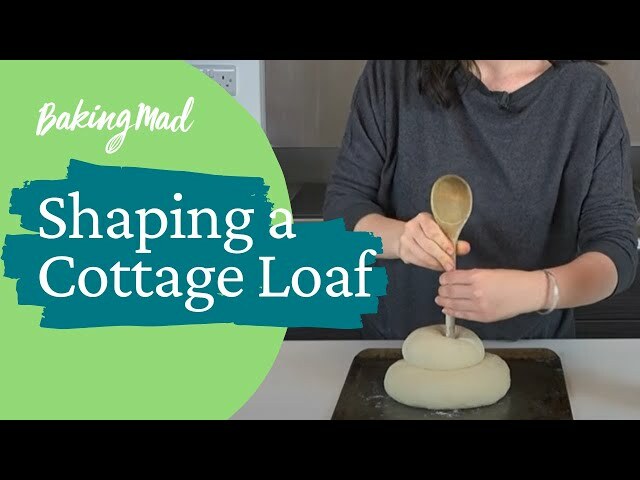 Just follow our six-step guide using Allinson white dough and you’ll have your own cottage loaf, with its distinctive shape and beautiful golden crust. Fans of the handsome Cottage Loaf should try our delicious seeded knot rolls, also made with Allinson white dough. MIX Mix the flour, yeast, sugar and salt in a big bowl. Using your fingertips rub in the butter until only fine ‘crumbs’ are left. Mix in the water with a cutlery knife. SHAPE Knock back the dough by gently kneading just 5 times to get the air out. Separate the dough into one-third and two thirds. Shape each into a round ball. Dust a baking sheet with a little flour, and sit the largest ball on it with the smallest ball sat on top. Flour the handle of a wooden spoon and push it down through the centre of both balls until you hit the tray below. PROVE Cover the dough with a clean tea towel again and leave to prove until doubled in size again. Preheat your oven to 200°C (fan 180°C, gas mark 6). BAKE Lift the tray onto the middle oven shelf and bake for 30-35 minutes, until when you tap the base of the loaf it sounds hollow. Cool on a wire rack. Made this twice now and it's a beautiful soft white load. And so easy to make. Only problem is it doesn't last very long because people love it so much it all gets eaten. I even get requests to bake it now. I made this yesterday and it tasted great. The amount of water needed may be slightly less tan suggested, as I made it with the full amount but the dough was softer than intended, which caused the top half to flatten the bottom and became like a giant bap. The crust was perfect as was the taste of the loaf. I will make this again, but next time will ensure that the dough is a little firmer.